Focus on self-reliance: An emphasis was placed on self-reliance by mobilizing social capital, local wisdom, and natural resources for sustainable rural development. There are two fundamental concepts that serve as the philosophical basis for the technique: 1) Self-awareness and 2) Self-reliance. Self-awareness is taught through discussions with the farmers by reminding them of the capital that they possess and for which they are responsible. This change of thinking will lead to the adjustment of their ways of thinking and subsequently to greater self-reliance. Examples of the capital they own include the following: Morality; Local wisdom; Habits of saving and helping each other; Warm family; Strong community; Rights & freedoms; Good health; Natural resources, etc. Farmer-centered and balanced development: An enabling environment was created to facilitate farmers to develop by themselves. Development meant not only improvement in farmer’s knowledge and capacity for income generation but also in morale and increasing human security. 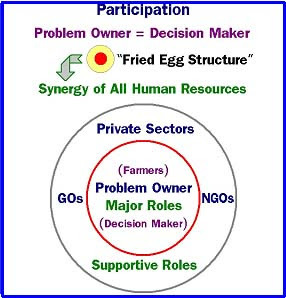 Participation of farmers: Active participation means that farmers must assume a major role in decision-making and managing their own affairs. Efforts were made to build confidence in farmers so that they make decisions on how to solve the problems identified by themselves. 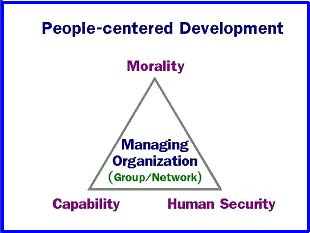 Other players such as the Government Organizations’s and Nongovernment organizations ( NGO’s) had supporting roles in that they provided guidance, comments, advice, and training required for confidence building. 1. Assembling the relevant people for a particular issue or problem. Gathering the relevant people in one place at the same time for discussion/action. 2. Brain-storming about impacts of the past development projects on their quality of life, problems and possible solutions are discussed, and improvements are proposed. 3. Working together. Suggestions arising out of the brain-storming sessions are acted upon rather than just discussed and dropped. This is an essential action step where theory, ideas and new knowledge synthesized from the group’s experiences are put into practice. 4. Summarizing the lessons learned. After the working sessions are concluded and the chosen activities are carried out, some time is taken to summarize as a group, the lessons learned from the working activity and brain-storming sessions. 5. Accepting the outcomes together. The final step in the first iteration of the process is reaching a consensus on the results and acceptance of the outcomes as a group with shared rewards and a feeling of community. This is a step of discussing, realizing, accepting, and participating in the results of the group activity. 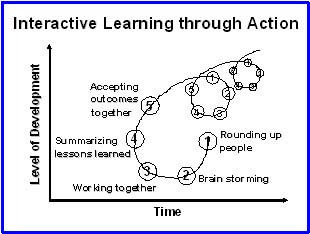 This is a step wherein social capital is built from the interactive learning experience. Action research by farmers: Farmers were encouraged to conduct field experiments with advice from researchers. Knowledge and experiences gained from field experiments by different farmer groups or networks were exchanged through interactive learning forums. 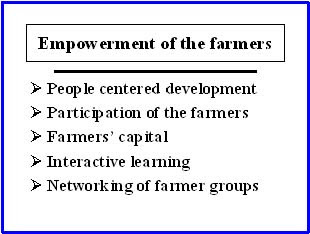 Networking of farmer groups: Exchange and interactions between individual farmers or farmer groups include interactive learning and participatory technology development and transfer. Farmer networks are a way of facilitating farmer to farmer exchange of knowledge and experiences related to agricultural practices, natural resources management and sustainable community development. We have implemented farmer capacity building in our site-specific nutrient management by selecting farmer leaders and working with them in training and disseminating improved nutrient management concepts in maize farming communities in the maize belt of Thailand. From the work during 2002-2004, we have selected 67 farmer leaders on maize production. These farmer leaders are now disseminating our site-specific nutrient managements to their members in the four provinces of maize belt in Thailand. 1. A conceptual forum in which the objectives of the project was shared and discussed. The farmers were encouraged to become self-aware and to exercise self reliance and the use of local wisdom. Self-awareness is taught through discussions with the farmers by reminding them of the capital that they possess and for which they are responsible. This change of thinking will lead to the adjustment of their ways of thinking and self- reliance. Ideas emphasized included: local wisdom and how to manage their lives. The farmers were screened to join our project as researchers with the supervision from local officers. 2. An academic forum was held in which the concept of sustainable agriculture, importance of soils, site-specific nutrient management, soil series identification, and NPK analysis by soil test kit were taught. 3. A practice or action forum was held in which the farmer leaders learn how to manage and conduct an experiment. There were about 3-4 forums before the crop harvest and one more after harvest in which the obtained harvest data were discussed. The collection of the basic data of farmers was carried out by our team. They recorded the capital, investment, income, occupation, local leaders, etc.